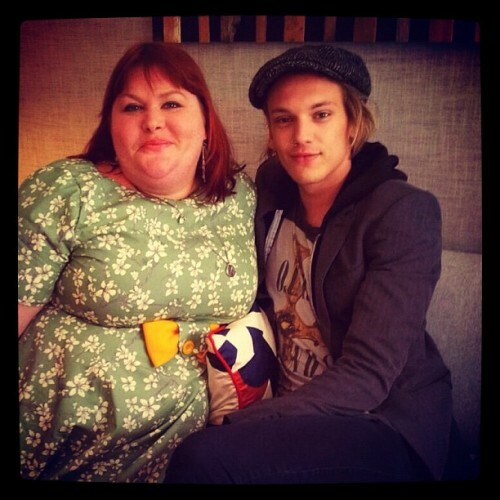 Jamie Campbell Bower and Cassandra Clare got together with Glamour Magazine UK to do a QA session on twitter. 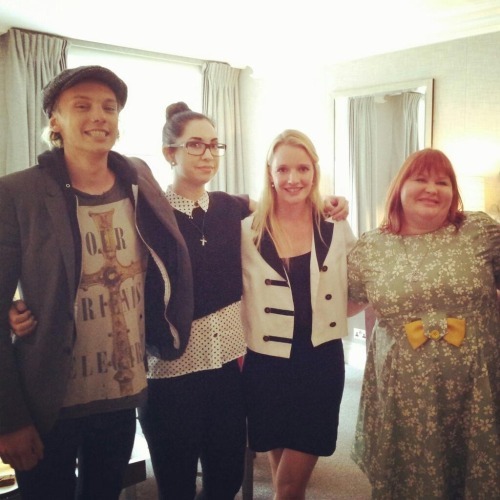 Although this Q&A was for City of Bones, they talk about returning (to Toronto) at the end of September for City of Ashes! Which characters are the best role models in The Mortal Instruments?Cassandra Clare: Each has something different to teach people. How hard was it doing stunts? Have you recovered?Jamie Campbell Bower: Very difficult and no, I’m still sore and going back to do number two [City of Ashes]! Best joke on set?Jamie: We had a lot of private ones, but none made much sense. I was probably the biggest joker. Favorite and least favorite things about Jace?Cassie: Favourite – that he’s loyal. Least favourite he doesn’t think before he acts. Jamie: Most favourite is his vulnerability; least favourite – the same as Cassie. How did the idea of this book series come about?Cassie: I was inspired after going to magical New York City. Jamie, you’ve said Lily is amazing as Clary, what was your favourite scene to film with her?Jamie: The Greenhouse scene. If you could play any other character, who would you play?Cassie: Magnus! Has the character of Jace inspired or changed you?Jamie: A lot. There are parts of Jace in me that I didn’t know existed. What was it that made Jamie’s audition stand out?Cassie: Jace goes through lots of emotional changes & Jamie was the only person I saw who could do that. What was your favourite weapon to play with and why?Jamie: The staff, because I’ve never wielded a staff before. Do you feel more identified with Jace before or after meeting Clary?Jamie: After. Cassie, could you give any hints to the plot of the last book?Cassie: We leave this world entirely, for a different world. What’s the #1 perk of being a shadowhunter?Jamie: Leather. If you could be any of the characters from City Of Bones who would you be?Cassie: Someone mundane & not in danger Jamie: The cat, Church. Jamie, is it true that you got a rune tattoo?Jamie: It’s not true. I’m getting a tattoo but I'm not getting a rune. I know what I’m getting. Best Jace line?Jamie: “To love is to destroy” – it’s pretty accurate. Jamie, any plans for releasing some of your music on iTunes?Jamie: Yes, lots of plans. Cassie, did your perception of the characters change after seeing the film?Cassie: Yes, when I’m writing I picture the actors. Shadowhunter, vampire, warlock, werewolf or mundane?Jamie: Shadowhunter. Would you consider doing a song for the soundtrack?Jamie: Absolutely. Unfortunately it didn’t happen this time. When are you back training for City of Ashes?Jamie: Right now. It’s killing me. I shouldn’t have eaten that pizza yesterday. Cassie, how do you make the decision of kill a character? How do you feel after?Cassie: I know from the start, there’s an arc. If you were a warlock what would be your mark?Cassie: Gills so I can find treasure underwater. I love scuba-diving but I hate all the equipment. Jamie, what was your first reaction when you found out you got cast?Jamie: I was shocked. I was prepared for a 'no'. I opened a celebratory beverage, watching Eurovision. When are you going to start filming City of Ashes? Which actor do you look up to? Jamie: Old school actors & generally actresses. I love Audrey Hepburn. Cassie, who inspired you for the character of Jace? Cassie: A bit Mr Darcy & Heathcliffe and a bit of people I’ve met in real life.